As a “companion piece” for my previous articles, I decided to take a different approach at what tactics I write about in a semi simplistic way. Whereas there is a plethora of information on offensive operations, not many people like to look to the more boring, common side of things: defensive positions. The defense is the “yang” to the attack’s “ying”. Integral to any sort of patrol, a defensive security posture is used more than one would think. Case in point: on the move, an infantryman will scan his surroundings to see if there are any nearby threats, such as IEDs or spotters for an impending attack. For now, though, we will focus solely on static defense, for it is a little less instinctual than basic security on the go. The purpose of a defense is, as written in the Combat Leader’s Field Guide, to defeat the enemy’s attack and to gain the initiative. Bearing that in mind, engaging in a defensive operation should seek to achieve destruction of enemy assets, defeat an attack, gain time, concentrate forces elsewhere, wear down the enemy, and control key sites or terrain. The defense should be done in such a way that it can enable a succinct counterattack by friendly forces, be it from any reserve personnel you may have or adjacent groups (we are assuming you all have friends). First we will tackle observation and fields of fire. When selecting a defensive position, ensure that it can offer adequate areas with unbroken line of sight to likely enemy patrol areas and avenues of approach. This can be ensured through natural means or through man made means, be it cutting vegetation or building sandbag emplacements. Fields of fire are mostly meant for crew served weapons, and a good leader will ensure the weapons have sector stakes marking the sector. Sector stakes are small sticks or string that outline the lateral range of movement for that particular troop. Fields of fire should intersect so as to not leave any space unprotected. Observation of minute details is key. Next consideration is cover and concealment. A good way to defend oneself is to make sure the enemy is uncertain of where you are. If they don’t know where you are, they can’t shoot you. Its really simple. Cover and concealment should adhere to camouflage rules, and make sure that your cover is adequate to protect against the most likely threats to be seen. 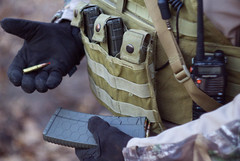 Cover differs from concealment in that concealment only blocks observation and detection, whereas cover blocks observation and bullets or shrapnel. Simply put, make sure you are in a spot where bullets can be hidden from and your position itself isn’t readily visible. Another major consideration addresses obstacles on the battlefield. Obstacles can refer to things that hinder friendly operations and tasks, but they also refer to things that hinder enemy operations and movement. Obstacles usually entail some hindrance to movement (not counting your fat airsoft gut), such as boulders, buildings, rivers, and cliffs. But they need not be natural. Minefields and concertina wire also fall into the category. The trick is to ensure that the obstacles around your defensive point give your side a strategic advantage while minimizing that advantage to enemy forces, i.e. setting up with one side of your position near a fast moving river so as to discourage dismounted movement from that direction. Following that, we look at key terrain. Key terrain is terrain that is of some tactical value to combat operations. You usually want to set up your position overlooking or on key terrain, such as setting up a FOB on a hill overlooking a town, so as to deny enemy artillery and mortar emplacements from being within range of the town. Key terrain, like obstacles, can be natural or man made. This includes rivers that lead near friendly bases, bridges that are sturdy enough to allow the movement or armored vehicles, cleared areas that can be used as a drop zone for air assault rotary wing or airborne jumps, or the BK across the street with the clean bathrooms. Finally, we address avenues of approach. An avenue of approach is a route, be it air, land, or sea, that affords tactical or strategic movement. This can be in regards to your own defensive position, as you don’t want any enemy forces to stumble upon your fighting position and mess your day up, or in regards to other locations, such as key terrain nearby. Avenues of approach can be controlled through the use of obstacles, such as picking a spot that is hard to navigate, like a swamp, or setting up claymores on any footpaths or clearings. Bearing OCOKA in mind, lets say you find the perfect spot for your mission. Now you need to set up your “unit” to be effective for the particular mission, be it conducting observation operations or just bedding down for the night as part of a long range patrol. The most common method to defend an area is done through a patrol base. A patrol base is set up hastily most of the time, is done temporarily, and is relatively simple to set up so long as OCOKA is considered. Overview of a Patrol Base straight from the manual. There are two shapes to a patrol base: the cigar shape, and the triangle. The cigar is good for smaller units, where you might not have either adequate firepower or personnel. The triangle is optimal, as it can be scaled to a platoon sized (read: 30 men) patrol and offers solid defensive capability so long as crew served weapons are had. We will first look at the cigar shaped patrol base. The cigar shaped patrol base is named so because, well, it looks like an elongated ellipse, which looks like a cigar. The group sets itself as if it is in a staggered column, with the Pointman and the Rear Guard watching the 12 o clock and 6 o clock, respectively. The long axes of the column look outwards and watch their sectors. The team leader(s) will go to their men and make sure their sectors are clear and interlocking, and sometimes to minimize signature, the columns will be so close that their legs interlock, so as to provide a silent wake up or early warning. Ideally, the Pointman and rear guard will change out with crew served weapon personnel if they are to stay in the position for longer than 30 minutes. The alternate (and overall better method) to setting up a patrol base is the triangle method. Simply put, each team or squad forms one side of the triangle, leading to all sides covered. At the apex of the squads, a crew served weapon is emplaced, so as to maximize fires along the most effective points. Because the crew served weapons,like M240B or PKM, are at the apex, their range of movement is really wide, and in the event the patrol base is about to be overrun, the MG can pivot its fire along the front of the squad taking the most fire, and form a sort of interlocking fire that prevents enemy forces from moving closer. On the inside of the triangle are rucks and non essential equipment, the command element with the RTO,and the sleeping area. Triangle Patrol Base. Notice the soldier pulling security outwards. While in a patrol base, you have what is called priority of work. These are the tasks that are undertaken while in a patrol base so as to maintain the fighting effectiveness of the men. These tasks include security, weapons maintenance, personal hygiene, hydration, food, and then finally a rest plan, in that order. Security should be as high as possible, at the lowest 33%, which translates to one out of every three men awake, and those that are asleep need to be ready to go at a moments notice. Machine guns and automatic rifles need to be manned at all times, which means they need to be cleaned, lubed, and ready to go as soon as possible, and everyone should know how to use them effectively. Finally, we need to cover developing a defensive position that will be in use for extended amounts of time. Lets say the patrol base needs to be made into a FOB. Guess what: you better get digging. Defensive preparations need to bear in mind that they need to offer protection from not only direct and indirect weapons, but aerial platforms and mitigate any openings a raid party can sneak in through. By digging a hole about as deep as the average M4 (or AR15 for you civilian plebs), and about 7 feet long, you enable a pretty decent fighting position where you can sleep and store your gear. Supplement that with sandbag emplacements around it, and you might even have enough room to sit up for a bit. Make sure to slope the immediate front of your hole so as to have a grenade sump and mitigate any incoming frags from rolling into your hole. Following basic foxholes, build overhead cover using sandbags and logs, so as to protect from airburst munitions and shrapnel. Set up claymores ahead of your position far enough so you don’t get any shrapnel but close enough you can observe them. Build ditches around the area and set up concertina wire in the ditch so as to stop vehicles from trying to enter and preventing enemy infantry from using the ditch for cover. Decent reference for an individual fighting position. Using the aforementioned information, you should have a warm and fuzzy on basics of defense, and should have some idea on how to set up a hasty defense. Defense is half common sense, half technique, but if there is one thing you take from this, make sure it is OCOKA. Any questions please place in the comments! This article was written using references from the Ranger Handbook, 2010 Edition, and The Combat Leaders Field Guide, 10th Edition. Literally the most unremarkable of soldiers. Four year Army Infantry, with two years of that spent shooting at NATO forces for a living. Former Professional LARPer now just amateur gear whore.